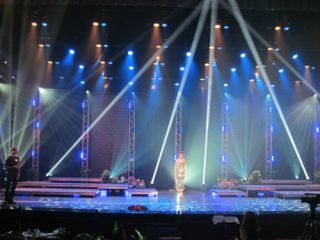 Clay Paky Sharpy fixtures made their debut at the Miss Florida USA 2013 pageant, which was televised from Davie’s Bailey Concert Hall on the campus of Broward University. The pageant was aired live in HD in primetime to fans across the Sunshine State. Michelle Aguirre was crowned the winner and moves on to the national Miss USA competition. The Orlando office of stage lighting rental and production company Christie Lites provided the Sharpy fixtures. A.C.T Lighting is the distributor for Clay Paky in North America.